Kids love assembling this one, so I recommend arriving at the party with your supplies and getting a few helpers engaged ! Assemble the appetizer, making sure the cheese ball is in the center and arrange on plate. Drizzle with olive oil, and sprinkle lightly with dried basil. 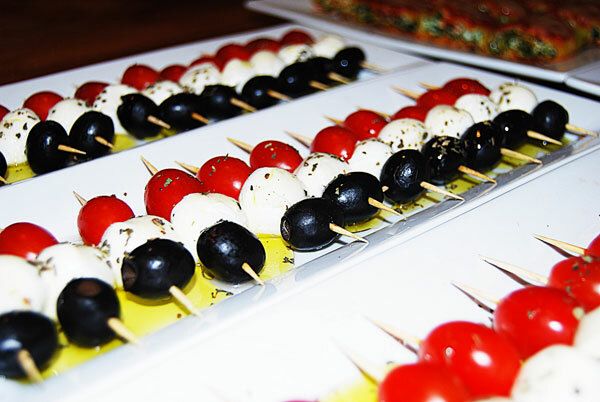 These can be made a day in advance, just drizzle a little more olive oil to freshen them up before serving. Thanks Peri ! My daughter did a report on Spain in her 7th grade history class, and brought Tapas to school…..These were perfect (and easy enough for a 12 year old to make on her own).